Kampala based socialite Bryan White has donated items worth millions of shillings to patients of Mityana hospital. The donated items included mosquito nets, sugar, toilet paper, milk, salt, soda and cooking oil among others. The donation was done under his Bryan White Foundation that he says is all about supporting those that are not position to help themselves. 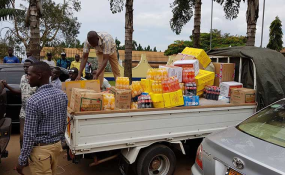 While his focus has been on unemployed youths, last week he and his team did a charity drive to Mityana hospital and donated items who's amount the team did not reveal, saying it was all about helping people and not bragging about numbers. Bryan White who has been living in Italy came into the limelight for his philanthropy and will to dish out money.